Move over cupcakes. There’s another fan-favorite in town—CAKE POPS. Imagine the deliciousness of a cupcake but in a mess-free, bite-sized morsel. As if that couldn’t sound any more enticing, they are amazingly easy to make and are customizable for any birthday, anniversary or just-because event. Frosting. This largely depends on the cake you choose. For example, red velvet pairs well with cream cheese. Chocolate can fulfill any chocolate lovers dream with chocolate frosting. Vanilla frosting pairs well with vanilla or white cake. These cake pops are your own creation. Lollipop sticks. Just that. Lollipop sticks. Candy melts. These can be milk, dark or white. It depends on your taste buds or if you’re going for a specific color. Extra-extra. Think sprinkles, nuts and coated candies. What inspires your taste buds? Crumble it: Now, roll up those sleeves and let’s get started. Remember that favorite cake we mentioned earlier? You’re going to crumble it into fine pieces. You want this cake to be unfrosted, otherwise this step is going to get a little messy. Don’t worry, we’ll add the frosting later! You can break the baked cake into small chunks and use a grater to achieve fine bits. The finer, the better! Mix it: Grab that frosting container; no judgment if a taste test is needed before continuing. Scoop about half of the container (traditional frosting containers are about 16 ounces) and mix it in with the crumbled cake pieces. This step falls heavily into personal preference. For moist cake pops you’ll want more frosting, for fluffier pops, you’ll use less. As you begin to mix the cake and frosting it will form a thick paste-like consistency. 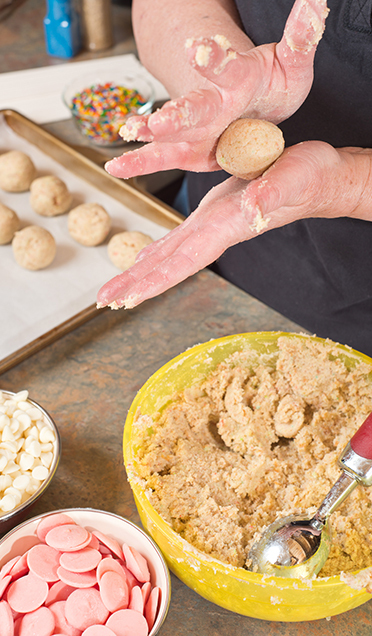 Roll it: Once the cake and frosting mixture has reached perfection, use a spoon to scoop and roll the mix into bite-sized balls. Gently stick the lollipop sticks into the rolled balls. Cool it: Place uncovered cake pops on a non-stick baking pan and place in the fridge until the pop has hardened. Melt it: While the pops are firming in the fridge, you can start working on the candy melts. Microwave or use a double boiler to soften your candy melts. Once they have reached a smooth consistency, set aside and get ready to dip! Dip it: Dip a little or dip a lot. 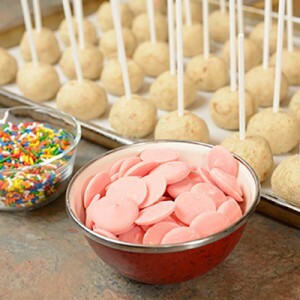 Cover your cake pops in the desired amount of coating. They can be fully covered or maybe just half. These are your creations! Decorate it: If you desire additional toppings, make sure to add them while coating is still soft. If it hardens before you dip them in sprinkles, nuts or other delicious items, your toppings won’t stick. For more cake pop ideas and inspiration, check out our Hummingbird Cake Pops. Now we’re at the final and most exciting step—Enjoy it! Take a bite into perfection. Let us know how they turned out or even better, share a final photo with us on Facebook, Twitter or Instagram! Don’t forget to include #Publix.